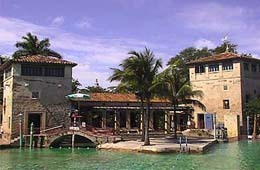 Miami Beach 411 : Tours : Venetian Pool : Scroll down for information about this historic landmark in Coconut Grove, Florida. In 1923, a coral rock quarry was transformed into the Venetian pool by Coral Gables' founding father, George Merrick; together with his uncle and artist Denman Fink and architect Phineas Paist. This 820,000 gallon pool is fed with cool spring water daily, and features two waterfalls, coral caves and grottos. The buildings are Venetian-style architecture. Today, the pool is included in the National Register of Historic Places. Note: Only cash and checks are accepted, no credit or debit cards. Classes in all levels of swimming instruction are taught by the Venetian Aquatic Club, a volunteer group. The pool also offers classes in water-aerobics, lifeguard training, snorkeling and scuba diving. Call in advance to reserve the facility for still photographic, motion picture and video photography. Call for birthday party reservations. Venetian Pool is available from closing until 10:00 pm throughout the year for parties and special events. The refundable security deposit is refunded after the event is concluded and no damage is incurred to facility and facility of returned to original condition. • Continue South onto US-1. • Turn Right onto Bird Road. • Turn Right onto Granada. • Continue North 16 blocks to Fountain. • Venetian Pool is located at 2701 De Soto Boulevard.